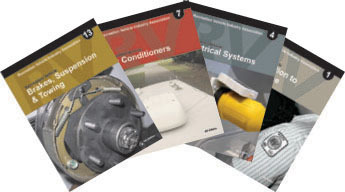 Certification candidates can benefit from a dynamic series of textbooks developed by the industry’s leading RV service experts. This traditional learning toolkit covers RV components and operating systems in stunning detail. To order your textbooks, please download and print the order form . NOTE: RVDA only sells the complete set. If you would like to order individual textbooks, please contact RVIA: (703) 620-6003.